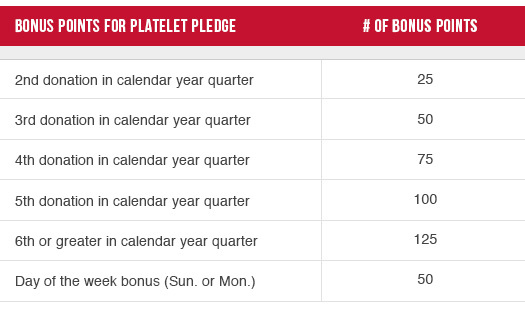 What is the Platelet Pledge Program? As part of Donors 4 Life we have created a program just for platelet donors. Platelet donors who give additional times each quarter can opt into the program and be awarded bonus points for the online store. This is in addition to the 150 points accrued for any platelet/plasma donation and the bonus points for the second third and fourth donation in a rolling 12 month period.